Last Tuesday afternoon, Emma and I found ourselves scrambling around a sticky hot kitchen. While I gave her directions on measuring this, leveling that, and “do you know what it means to cream the butter and sugar?” and “you should really crack the eggs in a separate bowl first, but we don’t have time for that.“; I also fielded the whining from a jealous little sister, “You never let me do anything in the kitchen!” and tried to comfort and keep tabs on my three house guests who I worried were wilting in the heat and bored out of their minds. For the two days prior, we’d lost electricity in a storm that seemed to settle in and swirl around our valley. And so this day, fair day, we were left to prepare almost everything. We were multi-tasking wonders–between baking and measuring, she’d do another touch-up on her painting. I’d dry the paint with the hair dryer while she wrote out the labels for her photography–I don’t want to talk about how many times we had to redo the labels…..while the cake baked, she changed her clothes, threw her hair back in a ponytail and we searched for our gate passes and read through the all directions one more time. What kind of paints did you use? What’s the name of your cake? At what temperature did you bake your cake? You could tell her that the eggs are from your own chickens. You could tell her the story about how you finished your painting and then your little sister got into the paints and covered it in black. And right on schedule at 4 o’clock, we all loaded into the car, her bag carefully packed with half a cake on a pretty teal plate, her photographs and her painting of a sheep. We made our way to the fairgrounds and found the judging table for the Clovers–the children who aren’t quite old enough to be full-fledged 4-Hers yet. She walked up to the table. And I stepped back. The judge was sweet–overflowing with compliments, asking sweet simple questions, nowhere near as difficult as those she’d fielded from me. And I smiled as I heard Emma tell the judge the story of the ruined and rescued painting. And then her things were carried away, into the big home arts building under the green flag of clovers. Set on display among other children’s projects–birdhouses and scrapbooks, knitted turtles and cross-stitched pillows, model rockets and strawberry jam. When we came back to the fair Friday night, I believe she entered the fairgrounds skipping. So proud of that little white card in her hand that proved she was a card-carrying 4-Her. So excited to show her Daddy her projects on display and dying to see those silky green ribbons she knew would be hanging from each one. So, I thought this morning in honor of the sticky hot fair days that are behind us, I’d share Emma’s recipe for Sour Cream Pound Cake. A recipe given to me years and years ago, which we’ve since made our own. It is so good and just the right amount of sweet. One of the judges even arrived at Emma’s table, fork in hand, “I just have to try this cake.” And afterward, I heard her whisper in Emma’s ear, “You make one awesome cake little girl.” and she reached for one more slice. Cream butter and sugar. Add eggs one at a time, beating after each. To creamed mixture add sour cream and flour mix, alternately. Starting and ending with the flour mix. Mix until just blended after each addition. Stir in flavorings. Pour batter into a greased and sugared (that’s the key) bundt pan. Bake at 325 degrees for an hour or until toothpick comes out clean. Cool in pan for 10 minutes. Remove from pan onto a wire rack and continue to cool. Sprinkle with powdered sugar. 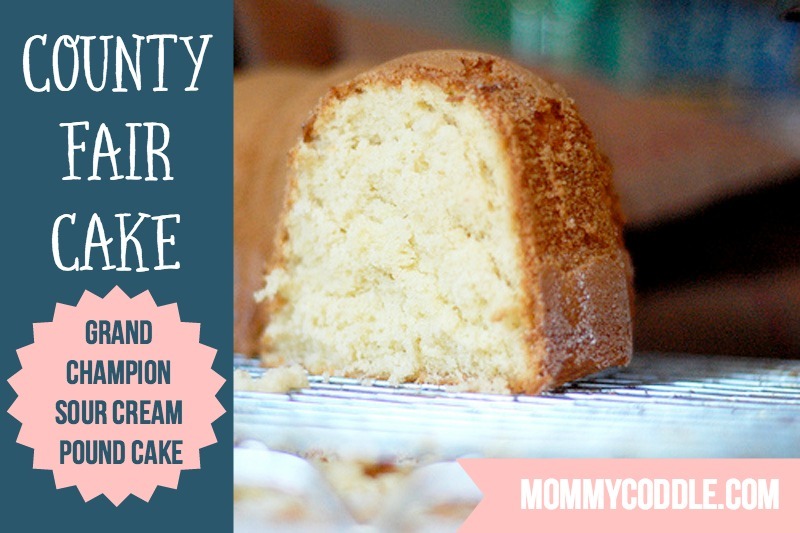 Don’t miss the recipe for Sour Cream Pound Cake at the bottom of this post. It’s a blue ribbon recipe! i want to see that painting! i’ve a houseful of kids tomorrow, and this cake may be on our agenda. bravo to your daughter… she should be proud! I know exactly how it goes, always the last minute getting ready for fair. This year we had to get ready early for fair get it to a friend to take for judging while we then packed to go on vacation for a week. Did not get any baking in because of when judging was. I think we will try your recipe for next year, sounds good. We are off to the fair tomorrow. Molly, what a beautiful, touching story! We are going to the County Fair this coming weekend in Cattaraugus Co. NY – where my husband grew up. It’s a summer tradition. I’m always amazed by how confident the 4H kids are. Would love to get my children involved like this, but we have our own issues to work with right now. Thank you for sharing this. I don’t have a bundt pan. Can I make this with another pan? It sounds amazing! Thanks for sharing. Question: I’m going to bake this cake today, but I’m confused on the sugar part 🙂 So 2 and 1/4 cups sugar go into the batter…and additional sugar is sprinkled into the buttered bundt pan, right? Just making sure none of the 2 1/4 cups sugar amount is used for the buttered bundt pan. Thanks in advance and can’t wait to try this recipe! I just made it yesterday! Yes just an additional amount of sugar for sprinkling in your pan. I will say though I cut back the sugar to 2 cups last night and didn’t notice the difference. Enjoy! !